The Celestron NexStar 130 SLT Reflector Telescope lets you view the details of the lunar surface, the rings of Saturn, the polar ice caps on Mars, the cloud belts on Jupiter, or a number of the Messier objects. The 130 SLT comes with a fully computerized, ergonomically-designed hand control that gives you the ability to automatically slew to any of its more than 4000 objects including over 600 galaxies, 300 clusters, and dozens of beautiful binary stars. New SkyAlign technology and the provided StarPointer Finderscope with a red LED also assist in fast, accurate alignment. With pre-assembled, adjustable stainless steel tripods, and quick-release fork arms and tubes, the telescope can be set up in a matter of minutes without any tools. Other features include an international city database to easily set your location. 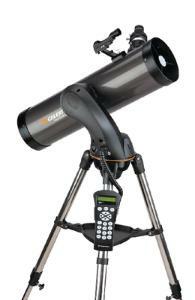 Ordering information: This telescope includes a Newtonian Reflector (Focal length: 650 mm), eyepieces (25 mm) with ƒ5 26x magnification, motorized azimuth mount, database of more than 4000 objects, internal battery compartment to prevent cord wrap during use, and auxiliary port for additional accessories.